Overview of New Microgaming Games for February 2007 including Porky Payout slot, The High Life Slot, and more. Capturing the lifestyle of the wealthy who know how to enjoy their good fortune, Microgaming have captured the essential elements of this in its new 5 reel, 5 pay-line video slot called THE HIGH LIFE. Read More about High Life Free Spins Feature Video Slot Game. 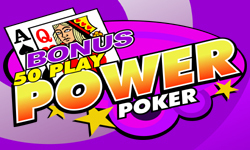 Bonus Poker 50 and 100 Play - Power Poker: - Another great offering in the massive power Poker series.